Here's another new release Crafty Secrets small set that will be released at CHA at the end of this month! 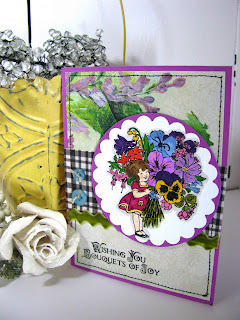 This one is called "Bouquets of Joy", and has the the CUTEST little vintage girlie holding this HUGE bouquet of flowers! I swear, she looks like she'll tip over, it's so big! I decided to go all "opposite" with my nestabilities dies, and use the scallop for the center circle and the round die for the mat. It's different, eh? The cool lilac patterned paper is from Crafty's "Radiant" paper pad. This set has great sentiments with it too; it also comes with a swirly sentiment that says "Thanks a bunch'. SUPER versatile! She's so pretty LZ, I love your coloring, love the bold colors! This is adorable!!! I just LOVE what you've been doing with the new releases ... so inspirational ... thanks!! Love how the flowers are so vibrantly colored! Awesome job as always!!! Very cute, Lisa! So cheerful and bright!